Very few bands have undergone the musical changes that Panic at the Disco have over the years and even less make it through retaining their former class. The American now-double act had just about managed it, until now. From the pop punk hallmark that was ‘A Fever You Can’t Sweat Out’, to ‘Pretty. Odd.’ (probably the most aptly named album of the 21st century) and ‘Vices & Virtues’. The number of members may have lessened and the sound may have changed but Panic At The Disco are still creating a stir with every new release, and rightly so. However, their latest release doesn’t justify the hype, with ‘Too Weird to Live, Too Rare to Die!‘ being their worst album to date. ‘Too Weird to Live, Too Rare to Die!’ will draw massive comparisons to ‘Save Rock and Roll’ and it probably should, because there’s a lot of similarities between the two. One is also a lot better, and it’s the latter. There are times on the former where you’d be forgiven for thinking you were listening to the latter, and vice versa. Urie sounds identical to Stump on some songs (‘This Is Gospel’, ‘Vegas Lights’) which is by no means a bad thing. It’s just that Brendon Urie no longer sounds like Brendon Urie. Like Stump there are vocal gymnastics aplenty but where Stump rides his momentum Urie simply drops off with his vocals being lacklustre on ‘Girls/Girls/Boys’ and a few other tracks. It’s a very strange dynamic considering his exceptional voice and capabilities. It sets ‘Too Weird To Live, Too Rare To Die!’ on a surprisingly mellow route and means the album never meets the soaring highs of past work. The instrumentals don’t really help proceedings, adopting a very electronic heavy approach, similarly to ‘Save Rock and Roll’. At times it sounds like the band is trying to soundtrack ‘Drive 2’, with a very retro feel to the songs here. A lot of the tracks simply plod along, which is painstakingly obvious from tracks five to nine, all of which sound very similar in the worst way. ‘Casual Affair’ starts with an electronic intro which sounds a little like Enter Shikari whilst ‘Far Too Young To Die!’ contains the only real ‘rock’ driven section, and it just sounds out of place amidst an album that never really seems to contain an input from drummer Spencer Smith. The synth influence of Dallon Weekes is more apparent this time round which is probably fitting considering the album was inspired by Las Vegas. Weekes does well in emulating that retro and glamorous yet seedy feel and looked at from that angle ‘Too Weird To Live Too Rare To Die!’ is better. The opening two tracks are probably the best the album has to offer (‘This Is Gospel’ and ‘Miss Jackson’) and it makes sense they were chosen as lead singles, with the following seven tracks seeming poor in comparison. Oddly, closer ‘The End Of All Things’ was my favourite track, existing as a simple piano driven song, with Urie lamenting ‘Lay us down, we’re in love’. For me, it showed how good Panic At The Disco are, without any shimmering electronics, being poignant and touching. Lyrically I found the album to be lacking – ‘Collar Full’ adds a bit of creativity but the spark seems to have diminished significantly in terms of song writing. After a lot of change the album sees the band settle, but they’ve settled for a sound that isn’t as good as their past releases. Taken as a concept album it improves significantly but the songs here don’t compare to those that occupied their first three releases. For me it all comes down to a lack of the energy that Panic At The Disco used to have. Even ‘Pretty. Odd’ was brimming with charisma and charm, and ‘Vices and Virtues’ had a few up-tempo rock songs. That energy seems non-existent on ‘Too Weird To Live, Too Rare To Die!’, bar a few dynamic choruses in the opening tracks. To me the whole thing seemed a little flat, and it’s a huge shame. 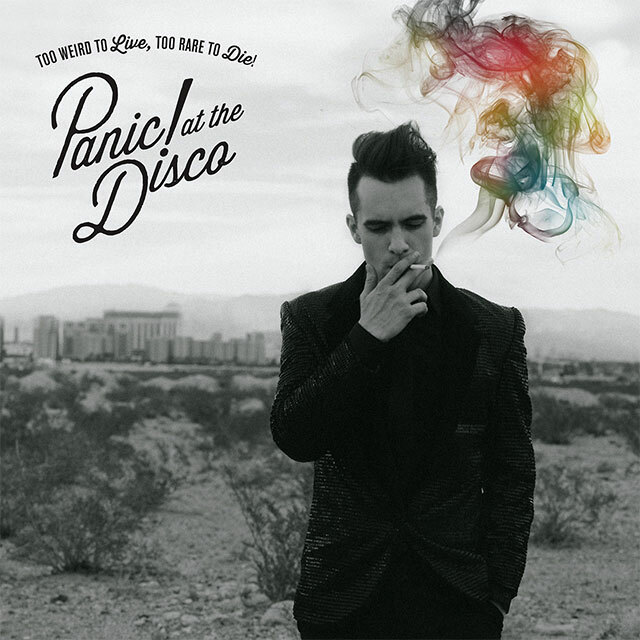 I love Panic at the Disco (their debut album completely changed how I saw music) but I just can’t love this album and to be honest, I’m not even sure if I like it. Love the band and three of the songs, like two more songs, dislike the other ones. This Is Gospel is a genius song, but I wish they’d write every song like that one. My thoughts exactly, it’s definitely a mixed bag. I’m glad it’s not just me who thinks so, I’m never sure how negative reviews of the big names will be received. Thanks for your thoughts.